Astrophtographer Vega Star Carpentier took this stunning photo on Aug. 11, 2012 in Épernay, Champagne-Ardenne, FR, using a Canon EOS 1000D. The characters of a celestial soap opera called "The Perils of Andromeda" are represented high overhead in our current early evening sky, with two independent mythological plots becoming intertwined into one. Two of the principal characters are Cassiopeia, the Queen, boldly standing out as a zig-zag star pattern, which, at this time of year, resembles a crooked number three or the letter M. Her husband is Cepheus, the King of Ethiopia, who now appears upside-down. Rather than looking like a king, he seems to resemble a church with a steeple or perhaps an Alpine ski lodge with a steep, snow-shedding roof. He's also quite a bit dimmer than his wife. 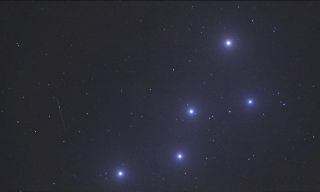 According to Greek mythology, Cassiopeia had a reputation for being a gossip and a troublemaker. In fact, the queen had gone so far as offending the sea god Neptune by boasting that her beauty rivaled that of the Nereides (the sea nymphs). As Cetus the sea monster approached, however, Perseus appeared on the winged horse, Pegasus. He was returning from a mission to slay the Gorgon Medusa, who had snakes for hair and whose hideous gaze turned observers to stone; he decapitated her and placed her head in a pouch. Upon seeing Andromeda's plight, Perseus swooped down (he wore winged sandals) and removed Medusa's severed head from his pouch and revealed it to Cetus, who immediately turned to stone and sank. So Andromeda was saved and became betrothed to Perseus, and our couple then rode off into the sunset on Pegasus. Putting a more modern twist on our celestial soap opera, whenever I look skyward these mid-autumn evenings, I can't help but think about one of the few long-running successful dramatic family television shows from the mid 1970s through early 1980s (and still in syndication), "Little House on the Prairie." Faithful viewers will certainly remember two mainstays of that show, Harriet and Nels Oleson. Harriet was portrayed as the snobby, rather mean and ridiculously haughty town gossip, while Nels, proprietor of the town's general store, (Olesen's Mercantile) was, in contrast, a meek, good-natured soul and a friend to all. Yet, throughout the show's nine-year run, Harriet always remained true to her nasty, gossipy, scheming, troublemaking self, much to Nels' chagrin. I've always found the similarities of the personalities of Harriet and Nels to Cassiopeia and Cepheus quite striking and pointed this out to many audiences at New York's Hayden Planetarium. And while the constellation Cepheus seems to resemble a church with a steeple, were we to speak of the "Harriet and Nels connection," perhaps we could refer to it as the building that housed Oleson's Mercantile. This spire-like figure of stars points toward the general vicinity of Polaris, the North Star, and its dim stellar outline is best seen on moonless transparent nights as it now wheels high above the celestial pole. The constellations of Cassiopeia and Cepheus also host some outstanding attractions for binocular viewing, so stargazers are advised to enjoy sweeping this region on dark nights. An amazing profusion of celestial treasures will pass before you: star clusters, highly tinted single, double and multiple stars, and even hints of faintly glowing nebulosity and dark obscuring clouds of gas and dust. This rich treasure trove seems fitting for the eye-catching stars of Queen Cassiopeia and the dim, misty countenance of King Cepheus. Might we then imagine the Milky Way as their flowing royal gowns woven out of stardust? Such a garment probably would have made even Harriet Oleson envious! Editor's note: If you snap a great photo of the November 2012 night sky and want to share it with SPACE.com, send photos, comments and location info to SPACE.com managing editor Tariq Malik at: tmalik@space.com.